Adults need to go into the spaces where kids learn – including their virtual spaces. If we don’t show them how to exist in these spaces in positive and meaningful ways, who will? Technology is a powerful tool through which we can share our stories and build meaningful connections. Virtual connections do not replace human connections, but they can help to enhance them. We need to innovate, including with technology – it’s not enough to simply put a $1000 pencil into a child’s hand. It’s not about devices – it’s about culture. What is the culture we are creating in our schools with devices? Today’s kids are born into a world filled with tech. Are kids creating and innovating because of or in spite of school? If we only teach the curriculum we have failed kids. And my favorite – the smartest person in the room IS the room. The bottom line comes down to relationships – how do we cultivate them and nurture them to make a difference in our students’ lives? Even though technology is everywhere (and can be pervasive), we need to deliberately and intentionally explore how to use it to cultivate relationships with our students so they see it as a multi-faceted tool that they can harness to add to the world in positive and powerful ways. 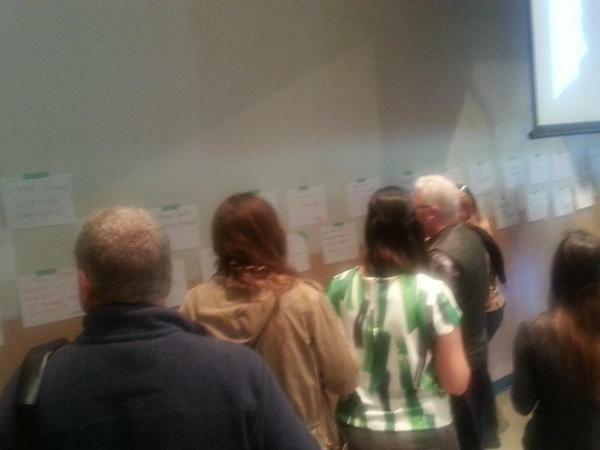 Saturday was all about Ed Camp… A room full of educators is buzzing at 8:30 a.m. There is a table with markers, tape and blank sheets of paper. The invitation is clear – write down a topic for discussion and post it on the wall. Once the first sheet is posted, a couple dozen more emerge. The writing is literally on the wall – every paper that is posted represents something that resonates with someone in the room – whether it’s because they are doing in their school and want to send the bat signal out to other schools to learn from and with them, or because it’s a concept they maybe have heard of and want to explore deeper with other educators. Everyone has three dots to “spend” and as dots are placed on the papers, trends begin to emerge. 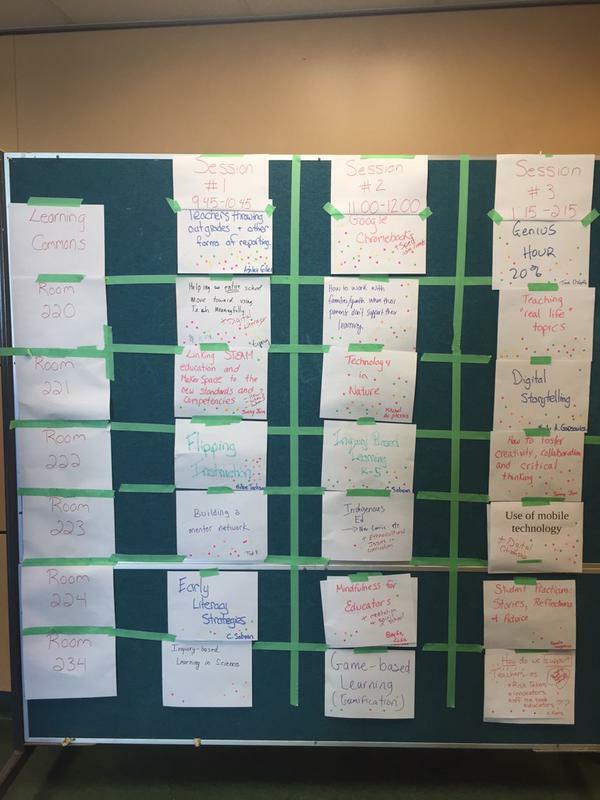 The organizers remove the patchwork quilt of possibilities and return 20 minutes later with a schedule of topics for the day. Maker Spaces/STEAM, inquiry, Chromebooks, How to bring faculty on board with Technology, Genius Hour, Mindfulness, Grading and Reporting, Flipping Instruction, Indigenous Education, Technology in Nature, Digital Story Telling, Nurturing Creativity, Collaboration and Critical Thinking, and more -the range of options is impressive, but I can only pick three! Who was it that said, “the smartest person in the room IS the room?” This is one smart room! We are off and running. The room multiplies into several rooms. There is no facilitator, there is no leader. Just educators in a room willing to talk, ask questions, share and ponder the possibilities together. What strikes me the most is that we are all more connected than we think – even though our schools are different, we are all asking the tough questions and exploring the possibilities for the future of learning. We are all connected by the learners who walk into our buildings each day. We are all united with a desire to give each learner the best possible learning experience that we can with the time, resources and talents that we have. This is my big take away from the day. There is a heart for learning out there in the edusphere and it is beating strong. If it’s beating in my city, then it’s also beating in yours.